Dramatic footage has emerged showing a knifeman being tasered by police near one of Britain’s busiest train stations – just hours after the Parsons Green tube terror. Police swooped on Birmingham’s New Street at around 1pm as the country remained on high alert in the wake of the latest terrorist attack in London. 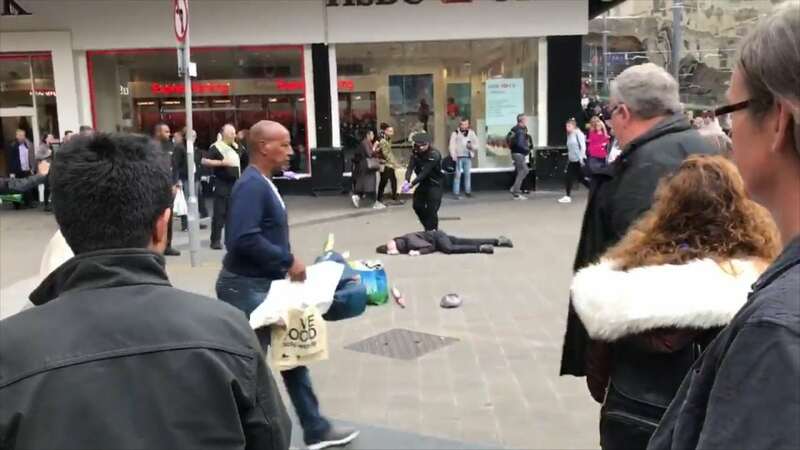 Four officers can be seen surrounding the suspect, who is twitching on the ground as one cop points a taser at him, in the middle of the city’s busiest shopping street. “I heard them shouting “drop the knife” and taser warnings and the crowd moved away hurriedly. British Transport Police confirmed the man had been arrested in connection with possession of a knife and taken to hospital. A force spokeswoman said: “A man has been arrested outside HSBC bank near Birmingham New Street station at 13.15 today. “Officers were initially responding to a call regarding a concern for welfare outside the station, when a man was seen with a knife, he was subsequently arrested on possession of bladed article and has been taken to hospital.